That major quake was the 25th major quake of a very busy year along the Pacific Ring Of Fire, however, since then the major quake count has dropped off the cliff, not just around the Pacific Ring Of Fire but the whole planet, volcano activity also stopped around the same time. Since then a mag 6.2 - 54km SW of Ovalle, Chile was the 35th and last major quake of 2018 to hit our planet almost a month ago, until yesterday. A mag 6.1 at Luzon the Philippines and of course the mag 6.9 on the South Island Hawaii woke up the Pacific Ring Of Fire with a bang. Of course, volcano activity also jumped back to life, not just with the Kilauea Volcano in Hawaii but last night the Mount Cleveland volcano, which is in the Aleutian Island range southwest of mainland Alaska sprung back to life with a mass of small tremors and an ash cloud reaching 22,000 ft above sea level. One of the most active volcanoes in the world, Le Piton de la Fournaise on Reunion Island in the Indian Ocean started spewing lava on Friday and continued into the weekend. We have to look at the Sun, Cutting across half of the solar disk, a wide hole in the sun's atmosphere is facing Earth and is spewing a stream of solar wind toward our planet. This extreme ultraviolet image from NASA's Solar Dynamics Observatory (see above) shows the gaseous canyon, the solar wind is battering our magnetosphere at 700 km per second. According to Spaceweather.com, Geomagnetic storms have intensified to category G2 as Earth moves deeper into a stream of fast-moving solar wind. 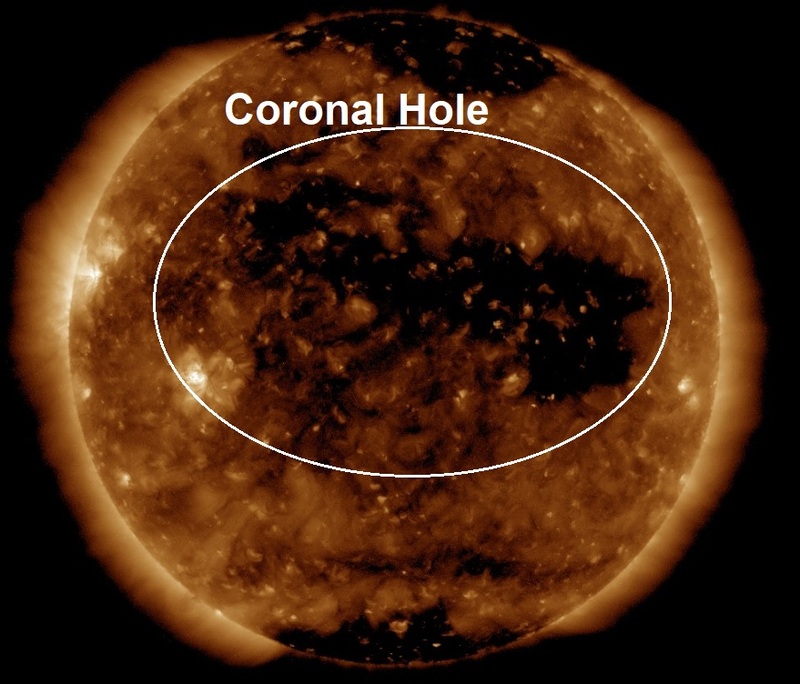 What does a Coronal hole have to do with earthquakes and volcano activity? Yesterday's major quakes were the 38th and 39th of 2018 and incredibly 38 of them have occurred during coronal activity. And it is no coincidence volcano activity has also woken up. Below category G2 storm affecting Earth. The principal users affected by geomagnetic storms are the electrical power grid, spacecraft operations, users of radio signals that reflect off or pass through the ionosphere, and observers of the aurora.